Crossing Permissions is a journey through the performance art body, responding to feminine place and landscape in Asia, Latin America and Ireland. Sinéad O’Donnell’s exhibition at Millennium Court Arts Centre documents a year long process including to camera performance, photographs, drawings and sculptural forms developed across three continents. The artist talks to DAO about the making of the work. Crossing Permissions is the title that I use to describe a process – a process that was like an unravelling of self, art, and others through, or driven by, feminist feelings through my performance practice. The process looks at my practice and the wider world of art that I place myself within. Ideas need time to grow inside you, to be in you, to become you and this project took some time to develop to a level where it was able to come out on paper and in an application format. This would never have happened if I had not met and developed a relationship with Jackie Barker, the director and curator of Millenium Court Art Centre in Portadown. I wanted to work with Jackie after years of attending exhibitions in the art centre and getting to know her vision for contemporary art. I felt that my performance work could develop further with the influence of her expertise, openness and knowledge of art. Crossing Permissions fermented from discussions we first had in 2016/2017. And so we worked together to develop and articulate my ideas on paper. At the heart of it I wanted to focus on the long journey a performance artist goes through in making work. The work is primarily live to an audience and at times to camera but always holding that raw physical presence of the artists’ body. As a project, Crossing Permissions has been about mutual exchange: living and working alongside women in Argentina, Brazil, Uruguay, Japan, Thailand and Indonesia. I shared my stories and they shared theirs. In each of these countries the permissions differed from culture to culture, community to community, artist to artist, woman to woman. Through the year and residencies I saw commonalities across the continents of women silenced, women mistreated, women uncomfortable in their bodies and shamed by their femininity, women trapped by their reproductive ability or shamed for their inability. I have tried not just to give a voice to all of these concerns, but to give an empowering voice. My performances have a history of giving a voice to women or subjects that have been stifled and prevented from being heard. I have not always been heard. I have dyslexia and I have been trapped by my inability to share what’s in my head in a coherent way that can be understood by those outside. Performing allows me to present an exchange of ideas in a non-verbal way that transcends language. 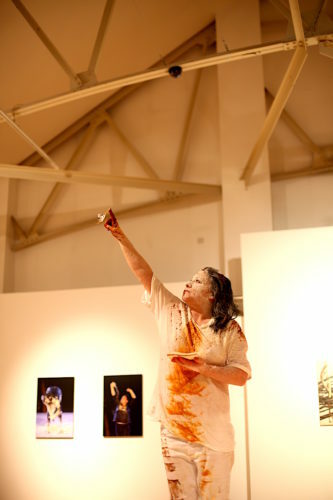 I am the first performance artist and the first openly disabled artist to receive a major award from the Arts Council of Northern Ireland and while it is true that this project could not have happened without their support, it is also true that this project could not have happened without the kindness, support and collaboration of women across the continents. We are all sisters in this world and to resist oppression and to survive we have to share our understanding of place in the world and within our bodies; we have to support each other, to join and merge through artistic forces. My work created a meeting point through performance art to be free. 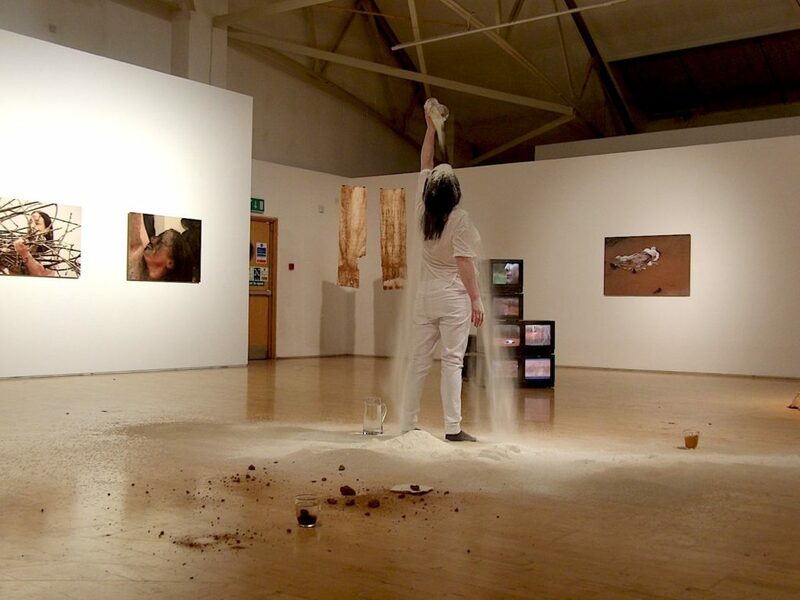 Crossing Permissions includes a wide number of outcomes including photographic, sculptural, performance art and video works. Deciding what to include was a very long process. I trust the unknown. With 100’s of photographs, drawings, performances, encounters, meetings it was a hard job to sieve through the work and identify a selection of resulting artworks that represents the project. You could curate this show over and over there are so many angles and ways to exhibit the works. That is where Jackie Barker and Johnny Cordner the exhibitions officer came in. They gave me an outside eye because when you are making performance and selecting works after a live work in a documented way, it can be hard to be objective, because each time you are reliving the real time performance. I hope the resulting exhibition will give the audience a feeling of being a part of my journey. Alongside the video installations, photos and traces of the performances that have taken place there will also be opportunities to see live performance events within the space. Can you come to Newcastle upon Tyne please? this sounds like an experience not to be missed .